After Eileen Chang, it was quite natural to read Wang Anyi, even if she does not appreciate being compared to this writer of the 1940s. 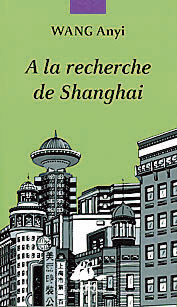 A little book has just been published in France “In Search of Shanghai” (1). The publisher P. Picquier has done much to make Wang Anyi known. Apart of the three “Loves”, small novels, almost classics, he has published one of the finest pieces of contemporary Chinese literature “The Song of Everlasting Sorrow” (2). The “Searching …” is a collection of short essays and short stories, rather disparate but some parts are quite interesting. It’s a walk in Shanghai and among Shanghainese. The roots of Shanghai are recent and everything is changing at great speed: “Shanghai has become much less sensual, new building materials have built it a shell that keep senses at distance. And how is this shell? There is not enough grip, I always feel that it contains emptyness”. The five short stories that follow are of uneven quality, but the last one is worth mentioning: “A famous mouth”; Dr Cheng, after studying in Japan, is a stomatologist and not a dentist, but his office attracts only a few teeth to extract … In a theater with his wife, he is seduced by the heroine of “The ecstasy of the favorite”, played by a famous actor for whom he will produce his masterpiece and who will bring him success …! If you liked this little walk with Wang Anyi, you might consider a marathon of 1500 pages with “Shanghai”, in the collection “Books”(3). The history of Shanghai is approached by several specialists fom very different angles. Interesting texts on literature in Shanghai (Isabelle Rabut), on Eileen Chang (Emmanuelle Pechenart), on Lu Xun (Sebastian Veg), on film (Luisa Prudentino) … An anthology of literary texts of 200 pages provides a number of new translations of authors sometimes a bit forgotten. Finally, a dictionary, a chronology, maps, an index … nothing of Shanghai is able to escape! (1) Wang Anyi, “In search of Shanghai”, translated into French by Yvonne Andre. Editions P. Picquier 2010.120pages, 14.5 euros. (2) Wang Anyi: “The song of everlasting sorrow”, translated into French by Yvonne André and Stéphane Lévêque. P. Picquier 2006, 680 pages, 23 euros. (3) Wang Anyi “The song of everlasting sorrow”, translated into English by Michael Berry and Susan Chan Egan. Columbia University Press, 2008, 456 pages. (4) “Shanghai, history, walks, dictionary and anthology” edited by Nicolas Idier. Collection ” Books” Robert Laffont, 2010, 33 euros.